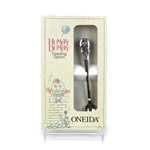 Humpty Dumpty by Oneida, Stainless Infant Feeding Spoon, Active Pattern: No, Circa: 1994, Size: 5-1/2", 18/8 Stainless, Betty Crocker Coupon., Specially designed for feeding an infant 3 to 6 months of age. Humpty Dumpty by Oneida, Stainless Infant Feeding Spoon, Active Pattern: No, Circa: 1994, Size: 5-1/2", Specially designed for feeding an infant 3 to 6 months of age. Humpty Dumpty by Oneida, Stainless Baby Spoon & Fork, Active Pattern: No, Circa: 1994, Size: Spoon 4-1/4", Fork 4-1/4", Flatware specially sized for babies 12 to 24 months of age.